A Medieval copper alloy pierced book clasp of Howsam type A.2, dating to the 14th and early 15th century. The clasp consists of a pierced rounded centre with a pierced terminal in the form of a stylised animal head. The clasp has an integral forked spacer with soldered-on top and bottom plates. The pierced rounded centre is called a 'loop' by Egan. The clasp would have been attached to a strap fixed to one cover of the book, and fitted over a peg mounted on the opposite cover (Egan 1998, fig. 214). 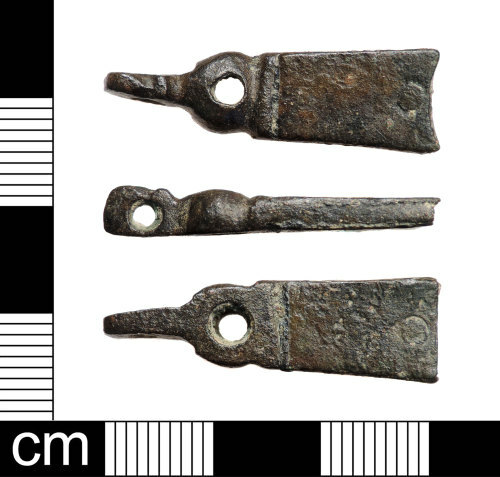 It is thought that the pierced terminal may have held a cord to help in removing the clasp from the peg (Egan 1998, 278). Dimensions: length: 47.39mm; width: 11.06mm; thickness: 5.34mm; weight: 8.20g. Similar clasps on the database are BH-379BB7 and LON-50D022.